**UPDATE** I’ve made my own version of this glowing potion tree using thrift store and DIY elements. You can check out the post here, or just skip straight to the video tutorial here. This week I have prepared a marvelous event, sure to bring lost souls from all over together! The theme for this week’s event design is an adults Halloween cocktail party, filled with LOTS of drinks and sweet treats! inside your invitation envelope, or would like to add little details around your house, you MUST get these mini glitter bats from The Pretty Paper Shop on Etsy. Use purple rope lighting throughout your home, perhaps on your counter tops or walls. If you are decorating outside, hang these cute purple bats up high to look like bats are circling above! They also make purple “Christmas light” style strands to drape around trees, branches, or wherever you’d like! off their costumes and take pictures. And, for those few (there are always a few) people who don’t want to dress up, you can put these glitter vampire lips photo booth props nearby. The Manic Moose on Etsy makes them, and lots of other great props! If you want more of a spooky look, or have other walls you can decorate, use these flying bat wall decals by In An Instant Art, also on Etsy. 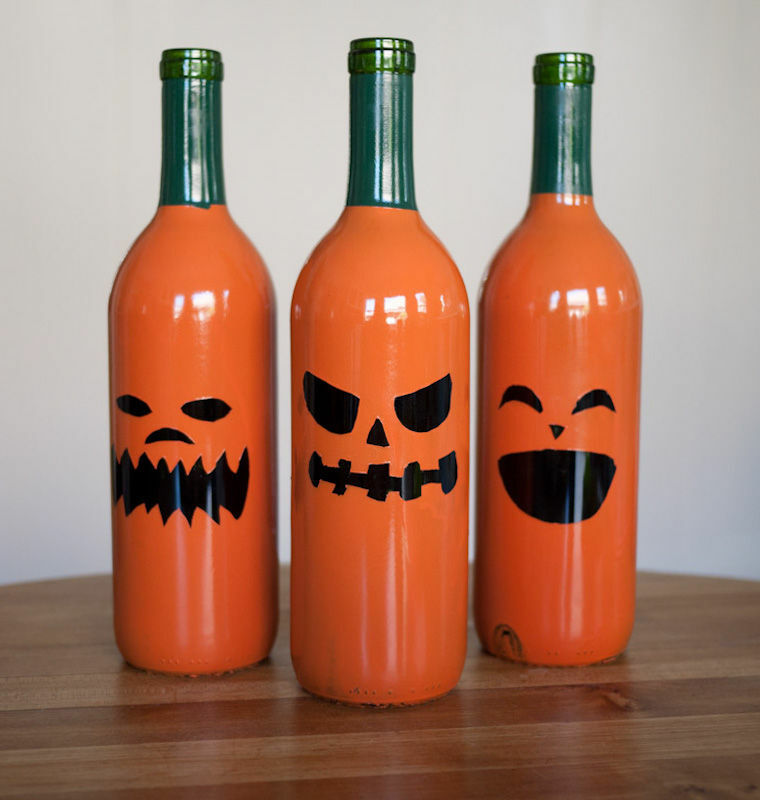 If your kitchen counters are not yet decorated, cluster some of these ghost wine bottle lamps by JLFuller08 from Etsy. They will look great and provide some accent lighting in your kitchen. Ok, so by now the outside is decorated in festive lights, the inside is decorated and smells great; you’ve got a photo booth decked out and ready to go. Crank up the Halloween Party Hits, or use the Pandora station from your computer to really set the mood of the party! But we aren’t done yet. We can’t have a party without food and drinks; I mean “spirits” in the case of Halloween! Let’s move over to the Witches’ Brewing Station. 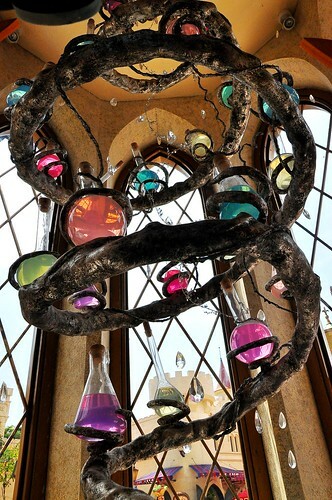 If you are crafty enough, you could make your own version of this potion chandelier over the table or area you will be serving drinks at. I love the idea of making this cocktails area look like an actual working witches station, so make sure to create lots of varied working layers, perhaps stacked on old books (another Goodwill find!). The back row of the table (presumably against a wall), and also the highest of the stacks, should be decorated with more lights, and these Witch’s kitchen, potion ingredient jars by Ta-Da!Workshop on Etsy. A little purple up lighting and some spider webs in the background will really make these pop! No Halloween party would be complete without a magical witches brew! This one can be made in a bulk, or a cauldron, and the instructions can be found here on Artistew. If you are making individual drinks per person, check out the tutorial by Kids Activities Blog. If you choose to make the drinks individually, it may be worth your time to construct your own version of this Sushisamba cocktail tree! This could be particularly gorgeous as all of the dry ice cascades down over the drinks. 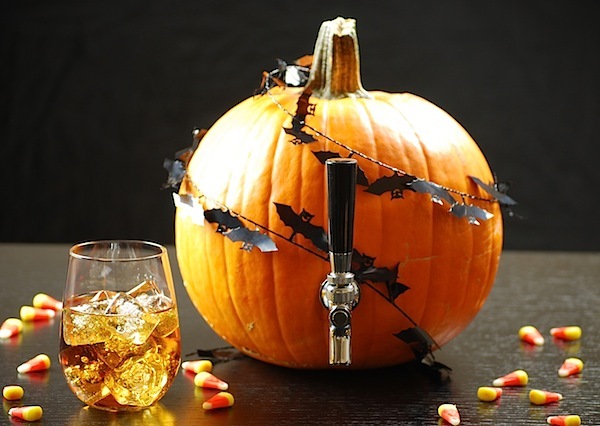 My favorite, of all of the options, is to carve your own pumpkin keg! I know, it sounds difficult, but Karen Miner from She Knows breaks it down, and it really doesn’t look TOO hard! I think that’s enough drinks! You don’t want TOO many options, but it’s always important to remember that everyone likes different drinks, so you try to have something for everyone! Thai Spiced Deviled Eggs, as found on Foodista. Or you could just make regular deviled eggs and garnish them to look like little pumpkins. Pretzel based Witches Broom Sticks by Mom Trends. It’d be cute to line them up vertically, like they were leaning against a cupboard door or something fun like that! These mini stuffed Jack-O-Lanterns peppers from Go Dairy Free look super yummy! Mini ghost pizzas are also a cute idea. You could take it one step further and put some black food coloring in the pizza sauce to make it look like the sky! Chef Mom has the how to here. Perhaps THE best part of Halloween- the treats! You can make the scary pudding cups by Kraft ahead of time, and will be easy for guests to pick up and enjoy as they mingle. Bakerella has a recipe and photo tutorial for these Pumpkin Pie bites. And while you are on Etsy, check out KBarnCrafts, who made the plate stand in the idea board! No party seems to be complete these days without some sort of cupcakes, so regardless of if you are baking them yourself, or buying them, top them off with these printable cupcake decorations! They are made by iDIYjron Etsy. As the evening is winding down, make sure to put a basket full of these M&M candy corn treat bags by In Katrina’s Kitchen near the door. And maybe a small cooler of water bottles decked out in the cute and festive label designs by That Party Chick on Etsy. You can’t have your guests drinking all of those fantastic brews and forgetting their water! 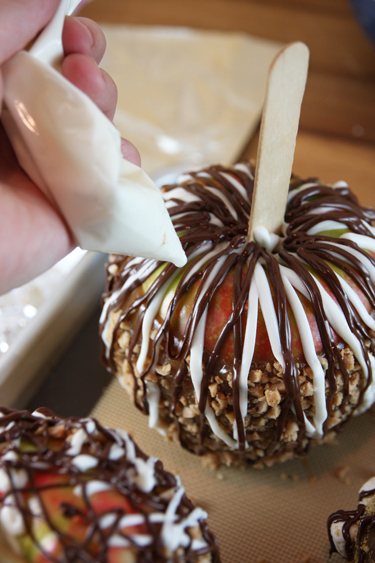 And if you REALLY want to give the ultimate take home treat, you can make a batch of these gourmet style dipped apples by Our Best Bites, wrap them up individual treat bags, and put these cute favors tags on them by NHACreatives on Etsy. This event is designed by The Sparkle Queen Events. Image sources are hyper linked in the text for easier accessibility. 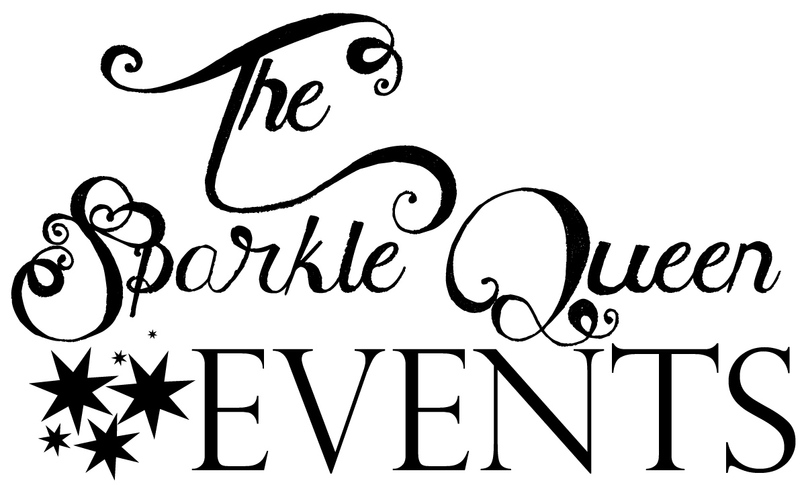 As with all Sparkle Queen Events, I want to inspire you to make your event extra special. While many of the items I include in my event designs are tutorials, recipes, or handmade, use your imagination! Sometimes you can’t make everything yourself, or you can make things that you could buy, but the key is to find the right balance for your event and strive to make it exceptional! : / Sorry Natalia! Pin this and save it for next year! What did you end making this year?